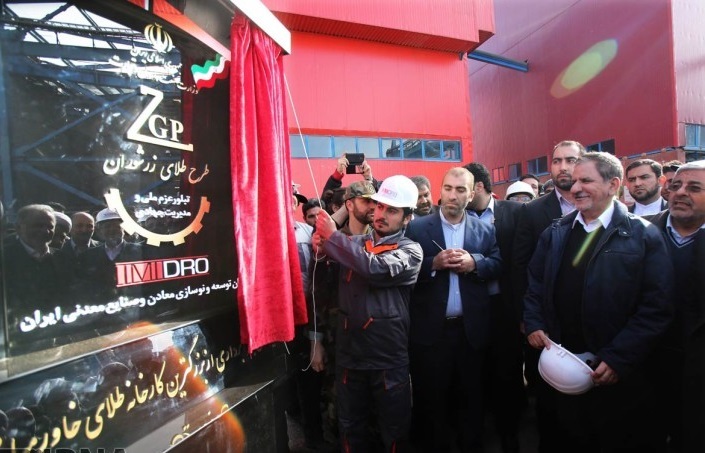 JNN 17 Nov 2014 TEHRAN:Iranian state television reported a new gold processing plant, “the biggest in the Middle East”, has been inaugurated, with the hope of doubling Iran’s production of gold up to six tons annually. The opening ceremony was attended by First Vice President Eshaq Jahangiri. The new facility is located near one of the country’s richest mines, Zareh Shuran. It is located 35 kilometers from the city of Takaab in northwest Iran, in an area where gold, silver, and mercury are extracted. According to Iranian authorities, the plant’s gold production capacity may soon reach six tons per year. Silver and mercury productions are expected to hit 2.5 and 1.5 tons, respectively. According to the Iranian Islamic Republic News Agency (IRNA), the plant will use a new technology that was created in Iran and is worth over $31 million. The gold plant is part of an “Economy of Resistance” introduced by Iran’s Supreme Leader, Ayatollah Ali Khamenei, in February to counter sanctions imposed over Tehran’s contested nuclear program. The policy includes domestic economy building with maximum utilisation of the country’s resources, and the promotion of a knowledge-based economy and innovation. The ultimate goal is to become the leading knowledge-based economy of the region. Iran has endured tough sanctions imposed since 2012 over its nuclear program, which the West claims is aimed at developing atomic weapons. However, Iran says the program is for peaceful, civilian purposes. The sanctions resulted in the reduction of Iran’s oil exports by more than half from around 2.5 million barrels per day. Iran is currently facing a 24 November deadline, decided by the United States, China, France, Germany, Britain and Russia, to reach an agreement on its program, within the framework of year-long diplomatic talks. Tehran would have to curb its nuclear work to ensure it cannot be applied to weapons, in exchange for removal of the sanctions that have hobbled its oil-based economy by cutting off the flow of payments for crude exports. According to the U.S. Geological Survey, Iran mined over 40 commodities and about 20 metals in 2012 – including 2,500 kilograms of gold. The country accounts for about 9 percent of the world’s output of gypsum and pumice, over 2 percent of its barite, feldspar and sufur, and over 1 percent of the world’s cement, sand, molybdenum and nitrogen output, the USGS states. Iran is planning to nearly double its natural gas production by 2018 even if the western sanctions against the country stay in place, a senior energy official announced on Sunday. “Over the next four years, our plan is to increase production to 330 billion cubic meters (bcm) per year,” Managing Director of the National Iranian Gas Company (NIGC) Hamid Reza Araqi said today. He noted that NIGC is working on four new phases of the giant South Pars gas field that will add an extra 100 mcm of gas per day to the country’s output. Last month, Iranian Oil Minister Bijan Namdar Zanganeh announced that Iran plans to boost production in the South Pars gas field to overcome the gas shortage in the country. “We hope to add another 100 million cm/d to the country’s national grid before the end of the year,” Zanganeh told reporters. The Iranian oil minister also said that the South Pars gas field’s output will increase to 540mln cm/d by the end of the next Iranian year (March 2016). This entry was posted in Iran News and tagged Gold, Gold Production, iran, Iranian Islamic Republic News Agency, Metal Minning, Middle Eastern, South Pars gas field, Zareh Shuran. Bookmark the permalink.